Complete the 5 fields listed below and then click "Create Product". Product Identifier - Enter your unique product identifier. The product identifier can be used across multiple seasons. 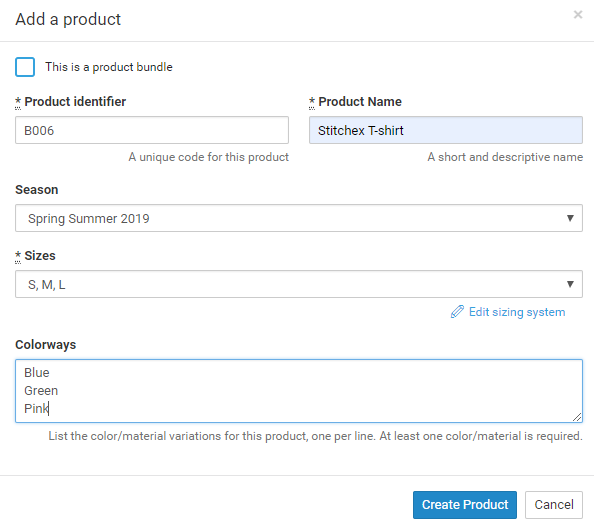 As an example, if you have the same product in the Spring as you have in the Summer, you can carry over all configuration items leveraging the product identifier. Note: This would not carry over the ordering/shipping information from one season to another. Name - Give your product a name. Season - Select the season in which you would like your product to be available using the drop down list. Sizes - Specify the sizes you would like to use from the drop down menu. For more information on editing your sizing system, please see our Sizing Systems Knowledge Article. Colorways - Specify the Colorways for your product. This is the list of color/material variations for this product. You must select at least one color/material variation. This information is important and will be used to complete your Product Image and Swatch Images and Color Standards. See those Knowledge Articles for additional information. Note: For information on "This is a product bundle" feature, please see our Combination Products (Bundling) Knowledge Article. Select the Category for your product using the drop down list. Categorizing your product helps you locate them more quickly using filters. Examples of categories are hats, dresses, etc. If you do not see the category you need, feel free to select "uncategorized". 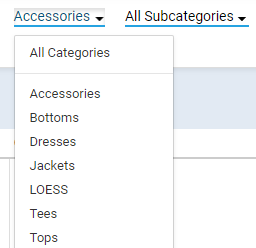 Or, if you want to create a new category, click the Setup Product Categories link below the drop down list to be taken to the Settings>Product Setup page. On the Settings>Product Setup page, you can also define your Subcategories. Also, see Product Display Order for how these categories and subcategories will be used. 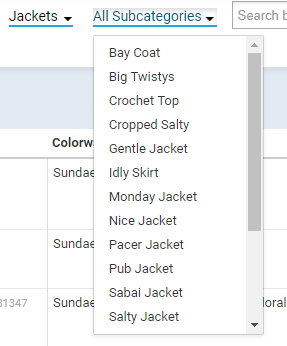 Select your sizes from this drop down list. Or, select Edit sizing system or Rename a size label. Currently, Stitchex does not support multiple sizes on a product. We recommend creating Size ranges, for example: 48/36. Specify tags which will help you search for your product later. You will add a Product Image as a "cover image" on the Image tab. The cover image will represent your product. You can click on the "Images tab" link to get there from your Product Details page or click on the Images tab directly. For additional information on Images, please see our Product Images Knowledge Article. Scroll down to the eCommerce and Showroom section where you can type a description for your product that will be displayed on your eCommerce and Showrooms. Use the toolbar to add bold, italic, underlining, bullet lists and left/right/center justification to your text to make it stand out. Switch between the eCommerce tab and the Showroom tab to add different text. For additional information on eCommerce, see our eCommerce/Showroom Knowledge Articles. Don't forget to save your work when you have entered this information by clicking on Save blue button in the top right corner. Directly below the eCommerce/Showroom section on your Product>Details tab, you will see a section for "Related Products". The "Related Products" works similar to "Favorites" on Contacts>Customers. In both of these places, you can add or remove products. These products will be displayed for your customer to entice their interest while they are browsing this particular product. 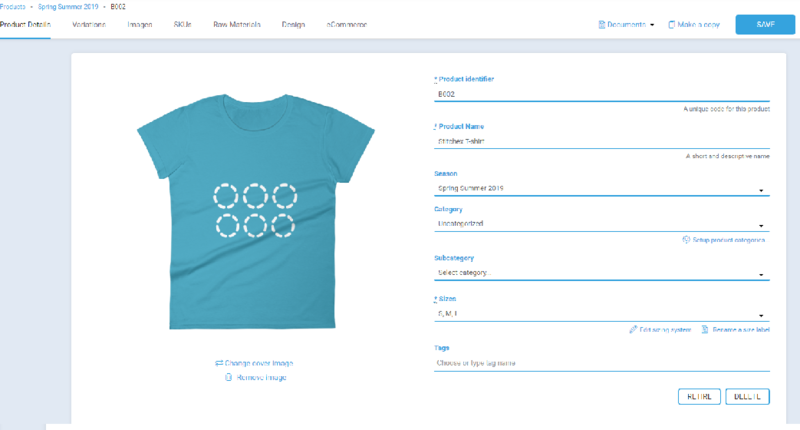 For example, if your product is a blue shirt, you may have other blue shirts you want to display as "related products". Or, perhaps there are boots, scarves, purses or other accessories that would compliment that product. NOTE: For your eCommerce/Showroom, the "favorite" products will appear for your customers as well if the products are in a Season that is not marked "hidden" and is marked to "Show in Showroom" under Settings>Season.